CALIFORNIA (state) — Multiple structures are being destroyed and thousands are under threat as the Woolsey Fire burns for the second day Friday. Several evacuation orders are stretching to Malibu. 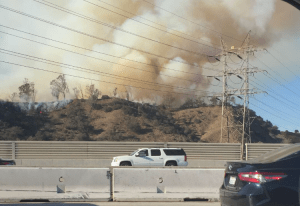 On the 101 Freeway Flames started to jump from the north side to the south in the Agoura area Friday morning around 5:30 AM. The freeway was closed in both ways at Liberty Canyon Road, according to the Fire Department tweet. After 7 AM, the news was reported from Malibu officials that stated the entire city had been placed under mandatory evacuation orders. An hour later, an alert was set in areas of the south of the 101 Freeway from the Ventura County line to Las Virgenes/Malibu Canyon, and southward to the ocean under mandatory evacuation orders but not the entire City of Malibu. One of the evacuation centers includes Palisades High School, which is located at 15777 Bowdoin St. Pacific Palisades, CA 90272. According to the Ventura County Fire Department, the fire had burned over 8,000 acres with no containment or expected containment. Over 75,000 homes are under threat and under evacuation orders in Ventura and Los Angeles counties. The number is due to Malibu evacuations; however, the total home evacuations number is not clear at this moment. Both mandatory and voluntary evacuations are set. And evacuation centers are open in Ventura and Los Angeles counties. Rancho Santa Susana Recreation Center, Camarillo Community Center, Borchard Community Center, Thousand Oaks Teen Center, and Goebel Adult Community Center are open in Ventura County. Taft High School and Pierce College are open to people in Los Angeles County.